Note: For more recent testimonials please check our facebook page for feedback from some of the many couples we have played for. Hi, You played at my wedding party in Clonbur, i just wanted to say a big thanks for making the night brilliant, every one at the party was very impressed by you and i have passed on your number to quite a few, a friend of mine is bar manager at Lisloughrey Lodge Hotel in cong he asked for your number also, i would recommend you to anyone as i really thought you were fantastic. Thanks again. Hello Lads, First of all apologies for taking so long to send this email. We would like to sincerely thank you all for playing at our wedding in Kinnity Castle. At the reception both ourselves and our guests thoroughly enjoyed the set you played. A good set of floor filling songs was what we wanted. The Irish dancing set was a highpoint of the evening. Everyone at the wedding commented on how good the music was. You were a totally professional group to deal with. In addition, as people you were extremely friendly to deal with and nothing we asked you was too much trouble. (Thank you so much for playing "Wish You Were Here!"). 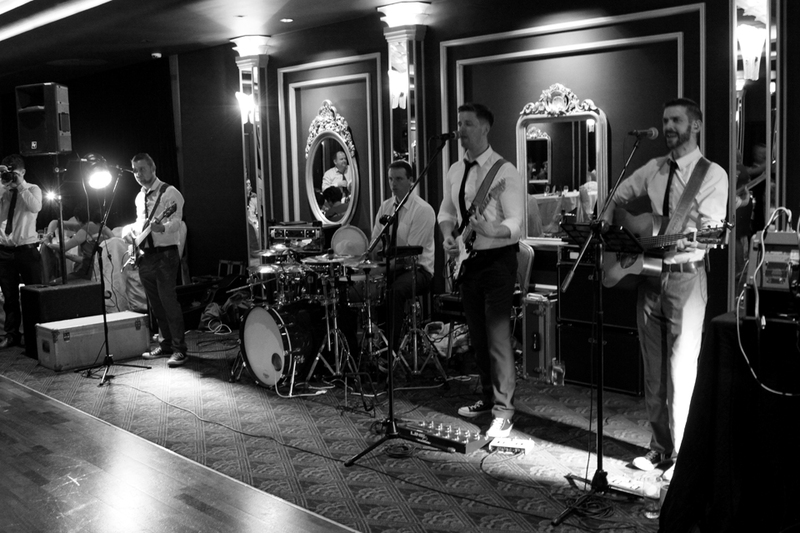 We would have no hesitation in recommending you to anyone as a wedding band as you certainly played a big part in making our wedding day a great success. Kind Regards. Hi Guys Thanks a million for the great job that you did on Saturday night. Lots of people said it was the best wedding ever and ye really helped make it the best night of our lives. If you need any testimonials we have no problem in giving you glowing references. Thanks again. Hi, I just want to say a huge thanks to you and the guys for playing at the wedding. You all really made the day very special for us. The song choice was brilliant and ye really got the crowd going. I am still looking at the photos smiling away. Video Killed the radio star surprise was great, although we probably deafened you all. David danced all night, he never dances. Galway girl was deadly. Dance off competition. The two boys were well impressed especially Dad he loves the attention ;). Everything was brilliant I could go on and on. I have recommended you to everyone and the guests are still going out about how great ye were so I hope ye get loads of bookings. I am going to write recommendations on all the wedding websites. You also have a little fan club going; few of the girls at the wedding were well impressed. I am surprised they didnt try and get their photos taken with you all. They are heading to Galway soon. Beware! Thanks again for everything, we might see ye again, do ye play at Christenings, ha ha only messing. Take care. Hi Just wanted to say thanks so much to all of u. You were amazing. Everyone thought so. Looking forward to hearing u again. Thanks again guys u made our special day great. Hi, Just wanted to say a big thank you to you and the band for your wonderful performance at our wedding. I was absolutely thrilled by ye and ye really made our day. I think all couples are anxious that their wedding band are good and we, along with all our guests, thought the Elastic Band were superb. The fact that you had the entire crowd on their feet all day is a testimony to you all. I have no hesitation in the world in recommending you to any couples out there who are looking for a wedding band and I intend in the near future to visit all those wedding websites to recommend the Elastic Band. So thank you all so so much, you made our wedding a little bit extra special. Thanks you very, very much for an excellent evening. We had so much fun, everyone commented on how good you were and wished ye could have played for longer, we are so happy with how everything went, the songs you did were brilliant, you kept the dance floor filled and we have even had feedback that yours was by far was the longest dance train they had ever been on! Thanks for letting me do the song with the Ruthe-ettes!, Jonathan was both frightened and amused by the performance so it was well worth it! Your one-liners between songs went down a storm, (There will be no favouritism here tonight when I was obviously agreeing to throw the bouquet in the head bridesmaids direction! ), your management of and interaction with the crowd was excellent (Come back! when the dance train migrated to the reception hall) and you sound brilliant on the DVD; we will send you a copy when we have it edited. It was a brilliant night, thank you so much. Thank you too for your professionalism and easy-going manner when setting up on time proved difficult. We would recommend you to everyone who needs a band to provide a fun atmosphere, as well as excellent music, for their wedding reception. Now that I am back in Australia, I just wanted to send a thank you to yourself and the rest of the band. Truly you guys were brilliant, so many of our guests have made comment about how good the music was and how everyone was up and dancing. I am so happy we booked you! One piece of feedback and take what you will of it... I do not think your marketing material does you justice. The reviews of the band on Weddings Online are really positive and not being local that is what I based my booking on! Thanks again, you really made the night.